Westport is one of those rare to find conservative super yacht builders, and this new 125 model took a long time coming for the USA Washington state builder. Testimony of this is that for example its 112 launched in 1998 has been delivered in 55 units as at 2015, and this Westport 125 which started development in 2014 is its first new model since seven years. This new Westport 125 is for a repeat client who upgraded from a 112 model. 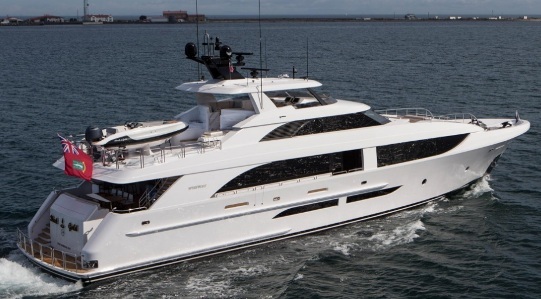 Hull one of Westport 125 features a five double cabin arrangement with an owners stateroom on the main deck. Crew cabins are three including of which is a captains cabin with a french style double berth. Power for the Westport 125 comes from twin MTU 2600hp which give a max speed of 25 knots, a cruise of 20, and a 12 knots long range giving up to 2500 nautical miles autonomy.